The concept of a funnel is not foreign to seasoned marketers. For years, companies have touted different shapes of funnels, upside down funnels and even the death of the funnel. While the funnel view does not perfectly explain the complexities of the B2B buyer’s journey, it does provide a useful guide for creating a winning marketing strategy. With that said, focusing on just one funnel can often lead to missed opportunities and suboptimal results. For the last few years, ABM has emerged as a must-have strategy for B2B businesses. ABM is a targeted approach that focuses resources on a select group of high-value accounts. This approach can absolutely benefit your business, but most companies will find that it is not the be-all and end-all that it has been proclaimed to be. As more and more marketers implement an ABM program, they have also realized that, on its own, ABM misses the high-intent leads and accounts that once filled their inbound demand gen funnel. B2B marketers need both ABM and inbound demand gen marketing to have the highest impact possible. These two strategies come together to form a new funnel: the “double funnel." The double funnel refers to managing a volume-oriented demand gen funnel and a quality-oriented account-based funnel. The two funnels work together to engage the target audience that display a high intent and readiness to buy, in addition to the accounts you identify as top priorities. Inbound Demand Gen Funnel. 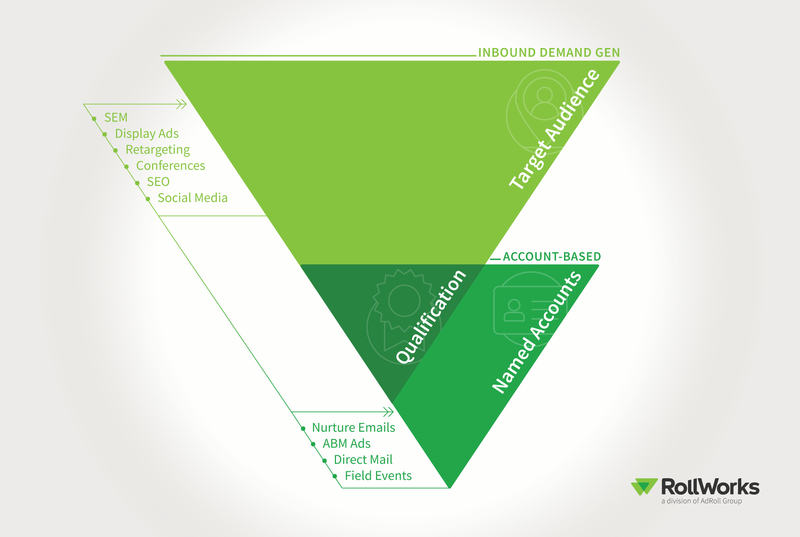 The traditional demand gen funnel uses inbound tactics such as earned and paid media, SEO and conversations at conferences to attract accounts with a high propensity to buy. It utilizes specific modeling to prospect and find accounts that match your target audience and exhibit interest. ABM Funnel. Account-based marketing starts with identifying the key accounts that fit your ideal customer profile and represent a significant opportunity for your business. ABM then uses coordinated marketing campaigns and sales plays to move these accounts to close. These accounts are the focus of any ABM strategy and receive more personalized touches through the funnel. This double funnel approach helps you create organic demand for your products, while also identifying target accounts and providing them with a customized experience via account-based tactics. In a well-oiled ABM program, marketers evaluate target accounts on an ongoing basis, with new high-intent accounts from the inbound demand gen funnel added as they are identified and qualified. Viewing your marketing strategy as a double funnel strengthens it beyond any single-funnel view. It allows you to maximize new business opportunities by marketing to identified accounts, as well as those who express high intent but are not necessarily on your named account list. The double funnel approach is key to increasing your marketing success — identifying the best and brightest leads and nurturing those leads to close via coordinated marketing and sales efforts. The funnel is a way to structure marketing strategy and tactics based on account stage. With the proliferation of ABM, a single funnel no longer provides a comprehensive view of all potential revenue. ABM has proven to be a high-value initiative when properly deployed and managed, but ABM alone will result in missed revenue impact. Marketers also need inbound demand gen tactics to supplement and support ABM. Managing a double funnel is key to maximizing revenue and reducing time to close. In addition to working target accounts, those that express inbound interest should also be qualified and nurtured, as they have expressed high intent and could close quickly. Ali Biggs is the Director of Marketing at RollWorks, a division of the AdRoll Group. Ali built her career on connecting people to brands via meaningful interactions. She enjoys taking a B2C marketing approach and conjuring up unique and informative ways to be at the forefront of a B2B buyer's mind. She is a savvy marketer with an array of experience, from campaign management to account-based marketing, and has a history of aligning sales and marketing teams through data-driven strategy.